A famous and traditional part of scouting uniform, woggles hold a neckerchief in place. They can be seen on scouts, cubs, beavers and their leaders, just below the neck, holding the two ends of the neckerchief ('necker' or scarf) together. 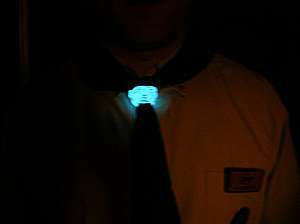 Woggles can be made of pretty much anything (even glow-in-the-dark string). Indeed, some scouts maintain that the best woggles are those made from scavenged materials. Leather is a common material, as is wood (carved and hollowed) or bone, and probably the most famous shape is that made from a Turk's Head knot in either cord or a strand of leather. The woggle (called a 'slide' in America) sits just below where the neck meets the chest. It should be positioned so that it would touch the lips if the tips of the necker are raised over the head. Lower down and it could swing up and hurt your eye, higher up and it could be a threat to your airway in an accident. This can get competitive. Woggles can ride over each other, and often a woggle will only stay on as the top-most woggle where the necker strands are thickest, causing them to fall off readily. Others can be low enough on the scarf to hit the eye. Multiple woggles may be apt at a jamboree but two woggles are generally as many as you should consider, and may be reduced to the one uniform woggle in formal situations. Every camp leaders pick up lost woggles from the preceding campers and search for those that our scouts and cubs loose. To keep a woggle that threatens to slide off in place, thread an elastic band or hair band around the scarf above the woggle. Twist it into a figure of eight behind the woggle and again around the scarf below the woggle. This won't be visible but will keep the woggle in place. If you do this, because it is difficult to adjust after fitting, it is particularly important you don't have your woggle too high or your necker too tight. These identify a lodge, six or patrol. Useful to identify assigned groups (for a new member, or a new leader), when group unity needs reinforcing or to aid a level of neatness. These may be worn with the uniform woggles, or alone. They may commemorate anniversaries, such as the 2007 100 years of Scouting Centenary Woggle, or attendance at a Jamboree or other memorable event. Any material, any how. The more individual the better. May be modelled to be colour co-ordinated or symbolically linked with six, patrol etc. As with the more carefully made crafted woggles they should display the best of scouts skills available in the situation. Many will be of ‘found materials’; the invention and craft shown will reflect on the wearer. The commonest know used for woggles is the one used for the Gilwell Woggle, given to leaders on completing their training. This is a Turk's Head knot and is straightforward, if a little long winded, to tie if you concentrate. Knots in scarves generally looks as if someone has not ‘been prepared’ and has forgotten, or lost, their woggle. The Friendship Knot (right) is an exception and sits at the bottom of the scarf. Some traditions put an overhand knot in the bottom of each tail of the necker. Knotting of neckers should not be so high as to prevent the necker from being readily removed.